This shower stool is designed to fit into a standard shower stall. Seat rotates 360 degrees in either direction making it easy to enter and exit the shower. 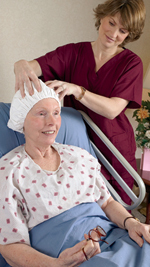 This seat is a real help for caregivers as they help patients while showering. Wide 18 in footprint and non-skid, suction cup feet hold the chair securely in place. Height adjusts from 16 in to 21 in. Diameter of seat is 16 in. Made of all plastic so it is easy to clean and won't rust. Supports up to 300 lbs.